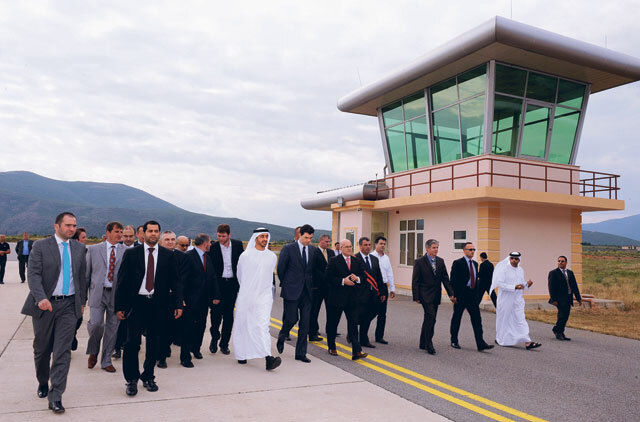 Tirana/ Kukës: Shaikh Abdullah Bin Zayed Al Nahyan, Foreign Minister, opened the Shaikh Zayed Bin Sultan Al Nahyan Airport in Kukës, Albania. The opening ceremony, which took place on Friday evening, was attended by Albania's Deputy Prime Minister Ilir Meta. Shaikh Abdullah also held talks with Meta, who had welcomed the UAE Foreign Minister and his delegation and expressed the hope that his visit would further contribute to enhancing ties between the two friendly countries. They discussed bilateral cooperation and opportunities for establishing a partnership in different fields. They also exchanged views on a number of issues of mutual interest, as well as the current regional and international developments. In a joint press conference held after the meeting, Shaikh Abdullah said he discussed developments in the Middle East, Afghanistan, Somalia, and the Iranian nuclear dossier — following the Security Council's resolution 1929 which imposes sanctions on Iran — with the Albanian Deputy Prime Minister. Meta lauded the wise leadership of President His Highness Shaikh Khalifa Bin Zayed Al Nahyan and the UAE's policies and stances towards regional and international issues. "We attach great importance and top priority to our relations with the UAE and we see plenty of areas for cooperation," he added. Meta pointed out that Albania was seeking to benefit from UAE's experiment in economic development and diversification of sources of revenues. Shaikh Abdullah also met Albanian Parliamentary Speaker Josefina Topalli who said she was impressed with the progress she saw during her visit to the UAE in 2008. Upon arriving at the airport, Shaikh Abdullah said: "We, in the UAE, are proud of our relations with Albania, and of our brothers the Albanians. We hope to see these relations developing and growing and we wish your country further progress and prosperity. The same wish goes to your neighbours in Kosovo." Shaikh Abdullah said he hoped that Shaikh Zayed International Airport in Kukes would serve as a symbol for strong relations between the countries. Meta said: "This airport shall bear forever the name of a great world personality, as Shaikh Zayed was and remains by virtue of his work; it was thanks to his personal engagement that the Kukës Aerodrome adjusted, at that time, to carry humanitarian aid directly from the UAE,"
"Bearing the name of Shaikh Zayed, this airport shall be an exceptional monument for life; it will not only bring to memory this extraordinary generosity by Emirates during a hard time for the Albanian people and our nation; it will also be made available for the community there and for the further strengthening of bonds among Albania, Kosovo and UAE," he added. Construction of the $22 million (Dh80.7 million) Kukës international airport started in 2003. It has a 1,900-metre runway, with a control tower, an air navigation facility and an integral fire brigade building.